Have duplicate records in your database? Not to worry! You can merge Contact Records as well as Group Records. Before you get started, we recommend that you review all duplicate records to ensure that the data you need is preserved in the process. We also recommend running a contact report that includes all duplicate contact/group data and exporting to .csv before merging. Why? Merging contacts or groups in the system involves selecting a "Winning" record. The winning contact or group record will remain in your database after the merge, and it should be the most up-to-date and complete record. You'll also select a "Losing" record, which will be deleted from the system. These records are deleted permanently and the data cannot be retrieved. While key activity and transaction data from the losing record will be transferred over to the winning record during the merge, most of the personal information on the "Losing" record will be deleted. 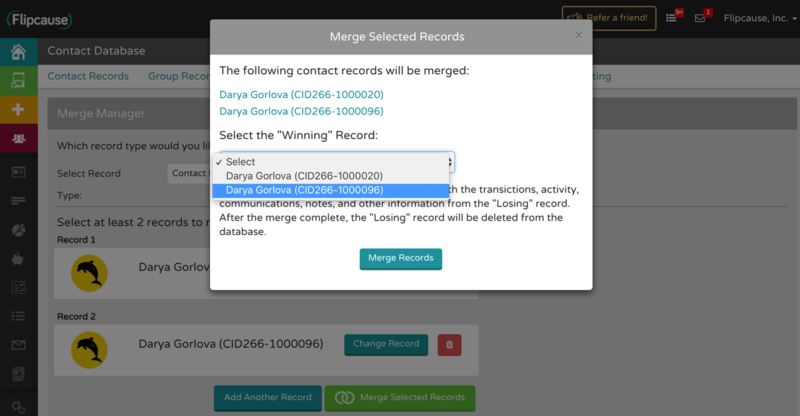 As a result, you may need to manually update some fields on the winning record with data from the losing record before completing the merge. By creating a backup of your CRM data before completing a merge, you ensure that critical information isn't lost during the process. What happens to your data during a contact record merge? The “Winning” record will be updated with the “Losing” record's data (see the list below), and the “Losing” records will be deleted from the system. All duplicate data from the merged records will be removed, and all “Primary” designations for names, emails, employers, etc. will remain the same for the “Winning” record. NOTE: If you want to to transfer any of the data from the above list to the winning record, you'll need to manually make these updates before merging. What happens to your data during a group record merge? Just like with Contact Records, the “Winning” record will be updated with the “Losing” records data (see the list below), and the “Losing” records will be deleted from the system. All duplicate data from the merged records will be removed, and all “Primary” designations for names, emails, employers, etc. will remain the same for the “Winning” record. When merging a Group record, you also have the opportunity to update or change the existing Group Name and Group Description for the “Winning” record. Go to Contacts > Merge Manager. First, select whether you want to merge Contact Records or Group Records. Then, search for the two records you'd like to merge, and click "Merge Selected Records." An overlay will display that allows you to select the “Winning” record. From the dropdown list, select the record that you would like to keep in your database. Whichever CID is selected as the "Winning" Record will be updated with the Activity History, Campaign Messages, Documents, Custom Fields, Engagements, Notes, Payment Sources, and Soft Credit section data from the losing contact profile. The Personal Details, Relationships, Important Dates, and Tags section data from the losing contact profile will get deleted permanently and the "Losing" record will be deleted from the database. See the earlier sections of this article for a full description of what data will be transferred and what data will be deleted. Please note that merging records is permanent and cannot be undone. At this point, we recommend reviewing the updated record in your system to make sure it contains all the details you need. If anything is missing, you can manually add the data to the record using the backup you created at the beginning of the process.